After travelling for 3 months, we finally arrive in Colombia. We cross the border from the Ecuadorian side through Ipiales and we reach Cali, an important economic and industrial centre of Colombia and popular for the Colombian Salsa. Here we stay at the hostel "Casa Amarilla" for about € 3 (10.000 Colombian pesos). It is a rather basic hostel, with almost non-existent mattress, without hot water and very small room. But we cannot expect much considering the low price. We stay in Cali only one day: we walk a bit into the city centre, visit the gold museum and the church of San Antonio; in the evening we go to the cinema in the shopping mall El Centenario to watch the movie "Everest" for 4.000 COP. The day after, we depart by bus (20.000 COP) to Armenia. From here we take a local bus (4.000 COP) to reach Salento, in the department of Quindío. The town is located at an altitude of 2200 metres and has a warm and humid climate. It is famous not only for coffee plantations but also for the presence of a particular type of palm, called wax, which is the highest in the world reaching a height of 60m. It is a small colonial village characterized by the presence of several craft shops and many colourful bars where you can taste the delicious Colombian coffee. You can admire a wonderful view of the village and of the whole surrounding valley by climbing 280 steps. From the main square of the village, we take a shared jeep with 2 other girls to reach the La Serrana hostel. Since we haven’t reserved a room, the only one available at the moment is a 4-bed dorm for 30,000 COP with breakfast included. We highly recommend this hostel, both for the nice people and for the high-quality services. The next day we do a coffee tour in the Finca el Ocaso (10,000 COP), about 40 minutes’ walk from our hostel. 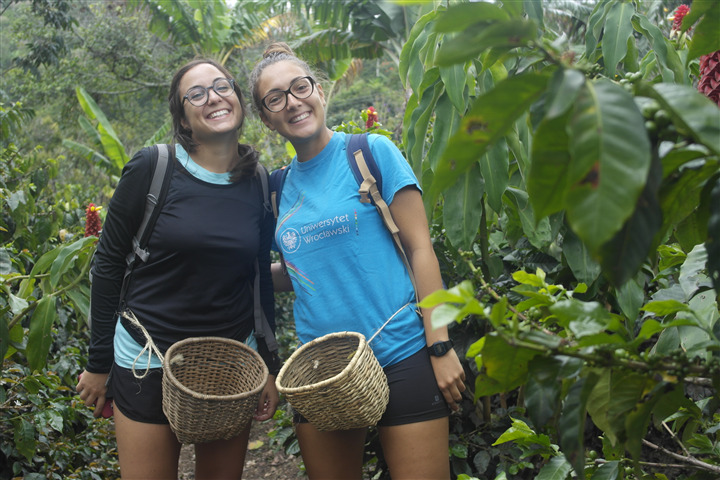 After a satisfactory explanation about the cultivation of coffee, we continue with the collection of coffee beans becoming real "Coffee pickers". At the end of the tour there is a tasting of different types of coffee and although we are not really coffee lovers, we are fascinated by the aroma so intense and we decide to buy a coffee package for our families (6,000 COP a pack). Then we keep walking around the lush countryside, and we stop for lunch in one of the local restaurants to taste the famous trucha - salmon trout - with rice, fried bananas and beans for 8,000 COP. We are together with two very nice Swedish girls, with whom we also do a few trekking in the surroundings and walks in the village. The next day we reach the central square of Salento where we take a vintage jeep called Willys - typical of the coffee valley - shared with other people (perhaps too many, since they to fill every available space both in and out of the car) for 3.400 COP per person. 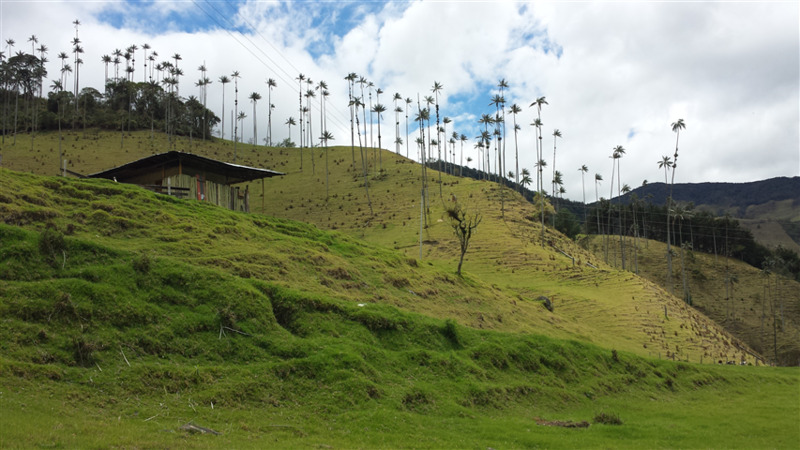 Direction: Cocora Valley which is part of the Los Nevados National Natural Park - Eje Cafetero. Once here, we see these incredibly tall palm trees. We make few trekkings, full of climbs and descents and paths with some unstable bridges made from trees. The landscape around us is amazing; we start the trekking from the "porta Azul" and from here we cross 6 bridges until we reach the crossroads of 2 streets where one leads to La Montaña and the other to La Casa de Los colibríes. Not having enough time, we decide to come back. The trekking lasts 1 hour and a half. But the complete trek takes from 3 to 4 hours. Before lunch, we plan to come back to Salento with a shared jeep but we have to wait until when the jeep is full before leaving. This time we pay 4,000 COP each because we are few people. We return to the hostel, have lunch and then we leave for the Armenia bus station. From here in the evening we take the bus to go to the capital of Colombia: Bogota! Without any doubt, this itinerary is a must in Colombia. During these days we were completely immersed in unique natural landscapes. To add value to this experience, as always, have been the people that we crossed along the way, really kind and available to give us useful advice and interesting information.